Hot Dates (with chocolate, football and mystery food)! Numero uno, friends, is Mystery Food Week 11. It was a delicious mix of sweet corn, tomatoes (Mr. Stripey!!! 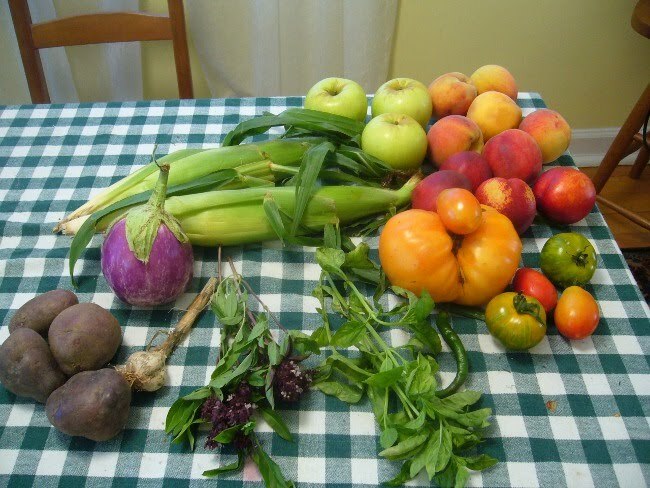 ), Thai basil, Italian basil, eggplant, purple potatoes, garlic, hot peppers, nectarines, peaches, and apples. So much food! And I only buy a half-share. Of course the first thing I did when I got home from picking this up was to make a big batch of tomato sauce for pasta. I love a long-cooked tomato sauce, but there’s something so sweet, simple, and wonderful about a quick summer sauce. The squash, potatoes and peppers ended up in a pot roast I made from a chuck blade roast from Polyface farms. I seasoned and seared the meat, caramelized some onions, and then threw everything into the crockpot with a splash of red wine to cook all day. When I came home, Dioji was very anxious to discover where the delicious smell that he couldn’t find was coming from (he’s not allowed in the kitchen while we’re not home–safety first!) and then whined at me when he realized it wasn’t for him. Oh sheltie. A pretty solid draft if I don’t say so myself. The Michael Crabtree thing was a lapse in judgment, I swear. We have another one this weekend, but I’ll be autodrafting because it is the same day as my brother’s wedding. I’m not sure he’d be too pleased with me if I disappeared from the reception to draft a fantasy team. And Numero Tres is that I’ve been craving filled pastry/cookies. I used to really like fig newtons heated up in the toaster oven when I was a kid. A week or so ago, I was in the market and saw some nice, soft Medjool dates. I remembered from when I was first diagnosed with anemia that dates were a good source of iron, but I’ve never cooked with them before last week. Recalling that the texture of my favorite kashi bar (the dark chocolate/coconut one) is made by creating a date paste, I decided to try a similar route. After several tries using the food processor to create said paste, I got frustrated because it never seemed to get sticky enough to hold everything together. The raw date bar recipes I searched all suggested that the approach would work, but it wasn’t the consistency I wanted. Finally, I found a good old southern recipe for date squares and modified it using a base recipe similar to my Banapple-Nut Bars. 1/4 cup 10-grain hot cereal or other high-protein hot cereal, dry. 10 grams 70% dark chocolate, chopped. In a small saucepan, combine the dates, extracts, and water over medium heat. Bring to a simmer, stirring occasionally until thickened. Use a potato masher or immersion blender to create a more even consistency. Stir in the cocoa and dark chocolate and set the mixture aside to cool. In the bowl of a food processor, combine the oats, ground nuts, cereal, cinnamon, baking soda, and salt. Slowly drizzle in the honey while pulsing occasionally to disperse evenly. In a small bowl, whisk together the egg and peanut butter, then add them to the food processor while pulsing occasionally until a sticky dough is formed. Grease a 9×5 loaf pan and press the cookie dough into the bottom to create an even crust. Next, layer on the chocolate-date paste, and then top with the chopped nuts and shredded unsweetened coconut. Bake for 20 minutes and cool completely before cutting into bars. So good. Not a drop of refined sugar or flour and yet somehow full of sweet, chocolatey, nutty goodness. Nutrition facts: Yields ten servings. Each cookie bar is approximately 138 calories, 7 grams of fat, 4.5 grams of protein, and 16 grams of carbohydrates. They are also a good source of vitamin A, vitamin B-6, folate, and iron. I think that this recipe could be easily modified into a good energy bar recipe by adding another egg white, replacing some of the oats with some wheat bran, and maybe adding some greek yogurt into the filling or base. If you were so inclined, you could replace the 10 grain cereal with a scoop of vanilla or unflavored protein powder. I’m really trying to keep things more natural these days. Oh, and if you want to blow your mind…mix a spoonful of the chocolate-date paste and some berries into 5 or 6 oz. of nonfat greek yogurt for a creamy treat. That’s a post-run snack I can totally get behind. Well, I’m off to Pittsburgh tomorrow for my brother’s wedding, so I’ll be M.I.A for a little while. In advance, have a great weekend and good luck to all my fellow fantasy team owners who have upcoming drafts.